When it comes to making the best use of smaller rooms and spaces, we try and incorporate pocket doors where-ever possible. They are fantastic for spaces that need privacy but do not necessary have ample size to account for the swing path of traditional doors. 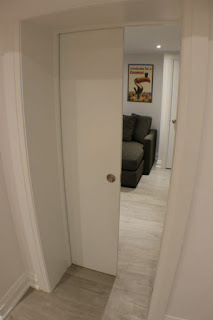 Pocket doors can also provide a sleek contemporary look to match a design layout for a room. Here is one from a recent project we completed.